Tis the season for hosting gatherings, sharing meals and savoring moments. I brought this simple salad to a holiday party recently and it was a hit. I knew I wanted to use fresh cranberries, but honestly didn’t really know how it was going to turn out. Well, it worked and I was asked by several guests for the recipe, so here you go. I cooked some Lundberg Countrywild rice according to the package directions, but you could use any wild rice really. 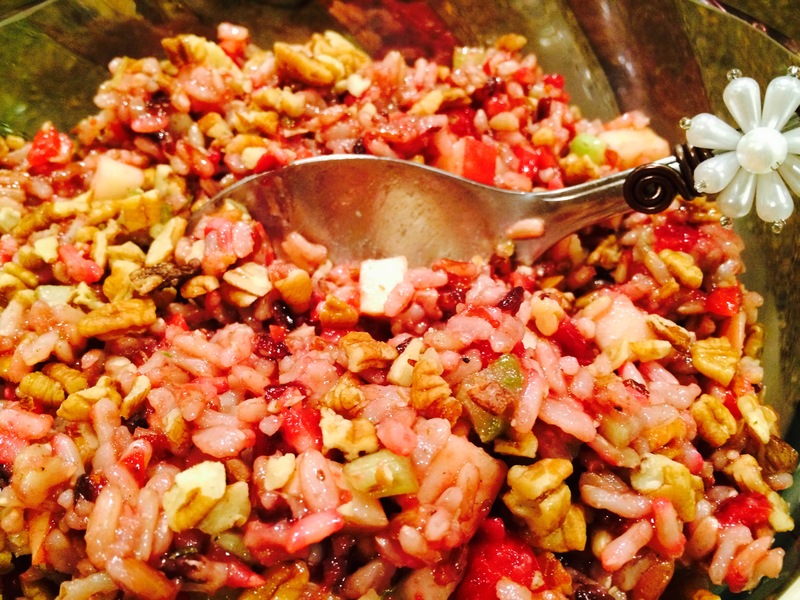 Then while the rice was still warm, I added chopped fresh cranberries so they would soften but not be too cooked. I chopped celery, apple and pecans to add. The whole thing was pulled together with a simple cranberry vinaigrette. I found the most amazing cranberry vinegar here in Houston at an oil and vinegar store called Vom Fass. If you can’t find that flavor, simply use a plain balsamic vinegar. As a culinary school grad and yoga enthusiast, I am very seriously into eating good healthy food and sharing creative, easy ways to prepare it. When I'm not cooking, I love teaching yoga, talking about yoga, reading about yoga and doing yoga. And I believe the more you live it, the more you find yourself wanting, even craving, clean wholesome food.